My kids were eating FunDip yesterday and we had a teachable moment. Remember FunDip? The stuff with the candy stick you dipped in the powdery and vaguely fruit-flavored stuff? My daughter, Gloria, ate the whole candy stick before the powdery stuff was all gone. She was sad, because she now had a bunch of vaguely grape-flavored powdery stuff and nothing to eat it with. The teachable moment for both of us was this: sometimes having both parts of something gets you waaay more than you'd expect from just adding them together individually. Things work better together. This is what's known as an 'emergent property' - put both parts together and boom you're onto something big. This same thing can happen when you take two parts of a pet access and containment system - a pet door and a wireless or in-ground fence - and use them together. Suddenly, you've got more than you expected and the world is a better place, and full of benefits for you and your pets. It might even be vaguely grape-flavored. To explore this a little further, let's look at each piece of the pair individually, and then we'll see how they work together. A pet door is the easy and safe way to free yourself from having to let your pet outside all the time because it does the work for you. With a pet door, your pet can go outside when nature calls, or whenever the desire to smell the fresh air strikes them. Imagine never having to put down your Sunday paper to let the cat or dog outside again! Pet doors are inexpensive and can be easily installed in various types of doors (from hollow-core, to solid wood - even sliding glass doors!). It's like having a live-in butler without the added expense and hassle (and remember - in most murder mysteries, the butler did it, so there's that). 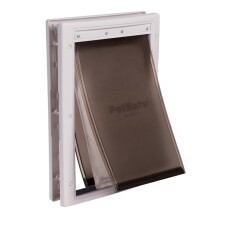 It's not only the outdoors that can be tamed with the help of a pet door. They work indoors, too, and can help give your pet access to only the parts of the house that you OK. Don't want a cat in your bedroom, but want them to use the laundry room litter box? A pet door is your answer. My very own pet door allows my indoor cats, Crispy and Cupid, to head down the basement stairs to the area where the litter box lives. Before I put it in, I either had to leave the door open all the time (which was a hazard with toddlers in the house) or hope I was around when one of my 2 cats had to use the facilities. Needless to say, I installed it pretty soon after we moved in, it only took me about 25 minutes to get it done, and it was far less than a butler costs. Jeeves, you're fired! If you want to make sure that only your pet can get through the pet door from outside and that nasty old tomcat that lives three doors down can't come in and kibble up your cats bits, there are even pet doors available that can only be opened if your pet has the magnetic key on its collar. It's like giving your pet (and only your pet) a key to the house. Really, a pet door is freedom. Freedom for you and for your pet. Worried that a thunderstorm will brew up while you're at the farmer's market and your dog will be stuck outside while you're gone? A pet door gives you the freedom to go out for a while and ensure that your pet can safely come in from the elements. Work long hours and would rather Aunt Percy's perfect Persian rug be free of pee (or worse)? A pet door means your pet can use the yard instead of your family heirlooms for a bathroom. How Do Wireless Fences Work? With a wireless containment system, there's no visible fence, just a defined area of security that your dog or cat learns to respect in a very short time. 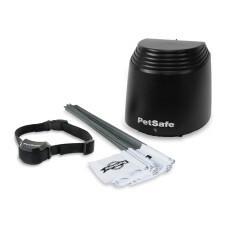 The in-ground wire transmits a signal to the training collar, which then emits a tone that gets your pet's attention. If they continue on outside the zone you've set, they receive a static correction - it doesn't hurt, but it gets his attention and teaches the limits of the boundary. The safety of a wireless system complements the freedom of a pet door perfectly. How Do You Use a Pet Door and a Pet Fence? Putting it all together: Here's where the emergent properties emerge. When you combine the convenience and ease of a pet door with the safety and peace of mind of a wireless system, you've just opened up a new world of exploration and freedom for both you and your pets. No longer are they dependent on you to let them out, or limited to a life indoors. And no longer do you have to be there to open the door, or worry that they'll stray off the property. They can come and go as they please, and you can set the limits on when they do it and how far they go. With a pet door and a wireless system working together, you and your pet move seamlessly through life. Either one alone is helpful, and both have made life easier for pet owners everywhere, but put them together and you'll have more time to enjoy life with your pet. You'll be glad you did.